Things aren’t how they used to be. Walking around Barcelona these days is almost like walking back to 1968. From my office window at work I can see daily groups of nurses, doctors and administrators blocking the local intersection. With banners, whistles and lab coats they protest against the massive Generalitat (Catalan Government) cuts to hospital funding. Last week when I went running I crossed the path of a massive train of people making the walk from Plaça Catalunya down Via Laietana to the bottom of Parc Citudella, several kilometres. These people were manifesting for the same cause, this time their numbers bolstered by the trade unions, the Unión General de Trabajadores (UGT; General Workers Union) and the Comisiones Obreras (CCOO; Workers Commission). 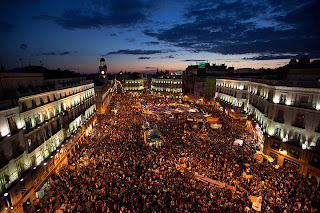 This week the people have taken to the squares in the major cities, to Puerta del Sol in Madrid (shown in picture) and Plaça Catalunya here in Barcelona. The squares have been taken in protest of the high unemployment, hitting 21% recently, government corruption, cuts and the municipal elections to be held today (22nd May). All the places around the city where they usually post the bills announcing the upcoming gigs are now plastered with campaign posters. Banners for the two main parties, the left wing socialists in red (PSOE; Partido Socialista Obrero Español; Spanish Socialist Workers Party) and the right wing Partido Popular (PP; People’s Party), hang from the lamp posts like coloured plastics gibbets emblazoned with the face of the candidate. Ironically, these lamp posts are being newly painted in the stretch of road which leads to my work and where the protesters are. 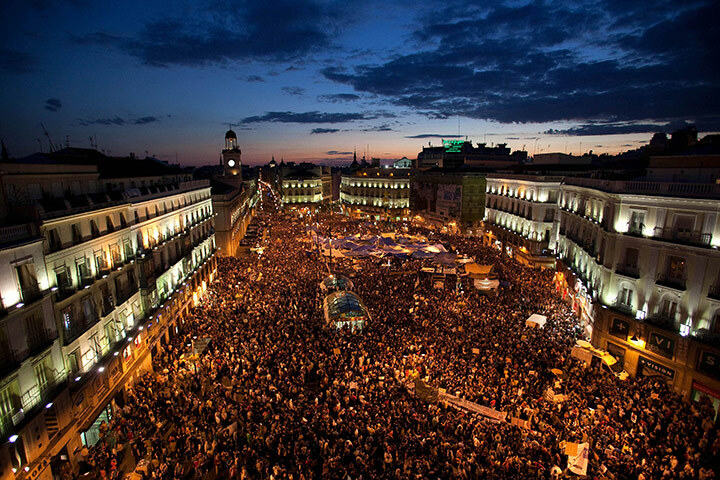 There is a law in Spain stating that there are no demonstrations allowed 24 hours before an election to allow “reflection”. The protesters in the squares were meant to be moved along by midnight last night, but Prime Minister Zapatero has stated that the police will not be brought in to shift the demonstrators. The mood is proud and righteous amongst the crowd of all ages, cooking and eating together, sleeping on the floor and making a din. A friend also pointed out to me today that there is not one Catalan Independence flag amid the banners crying out to “Fu€k the system”. This is an unusual sign in Catalonia where they are brandished daily in many places, from balconies, cars, shops, but perhaps their absence reflects a confrontation of a broader problem, one that also includes the Catalan Government. Here is a short video I made from the protest last night. There is a lot of sound lost from the poor microphone, but the rises and rushes of noise among the people were exhilarating. Keep calm - Take the square from Christopher Mann on Vimeo. All the protest and political unrest brings me to an album I heard for the first time only last week. It arrived at the local quiosco (kiosk) as part of an ongoing “mythical vinyls of jazz” series which has been running for 18 months already. One album every two weeks, all in original sleeves and hewed from 180 gram vinyl with an insert in Spanish. 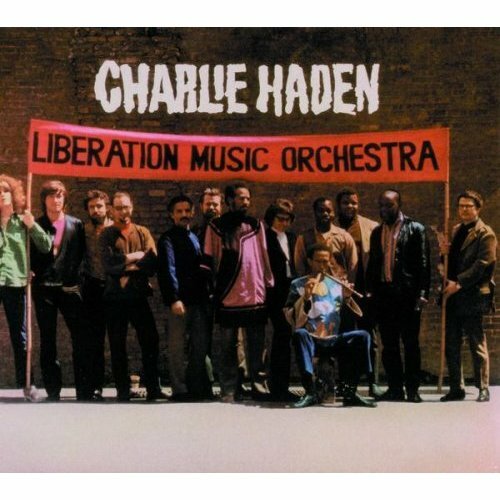 Last weeks issue was Charlie Haden’s debut album “Liberation Music Orchestra”. The music was recorded in April 1970 in New York, but not released until 1973 on the Impulse! label. 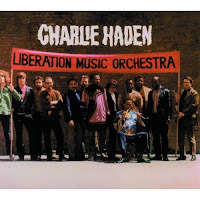 Haden was a double bassist and as well as leading his own group, he became renowned for his collaborations with Ornette Coleman and Keith Jarret amongst others. But perhaps it is his opening phrases which are more revealing as to where the music owes its stylistic origins: “This album was conceived several years ago when I first heard the songs of the Spanish Civil War.” Structurally the songs are a blend of both the improvisations and carefully arranged solos of Haden’s Liberation Music Orchestra, amongst them Don Cherry, as well as several revolutionary songs, some of which are layered beneath the groups playing. El Quinto Reginiento (The 5th Regiment). This piece opens with Spanish flamenco guitar before breaking into a processional waltz and eventually a jazz free for all, before returning to the beginning. Like many of the tracks on the album, this piece evokes the left wing struggle against oppression, in particular by referencing musically and thematically the 5th Regiment which was a military body formed in 1936 at the onset of the Civil War and composed mostly of volunteers from the Communist Party of Spain and the United Socialist Youth (Juventudes Socialistas Unificadas). The importance of the 5th Regiment in the Civil War was not only military, but as a symbol of possibility through their extra effort in social activities, distributing books and pamphlets, educating allies and workers as well as their relationship with many poets and artists. Apparently Haden had encountered the Civil War songs in this documentary about the Civil war from 1962 entitled “Mourir a Madrid” (To die in Madrid). Song of the United Front. 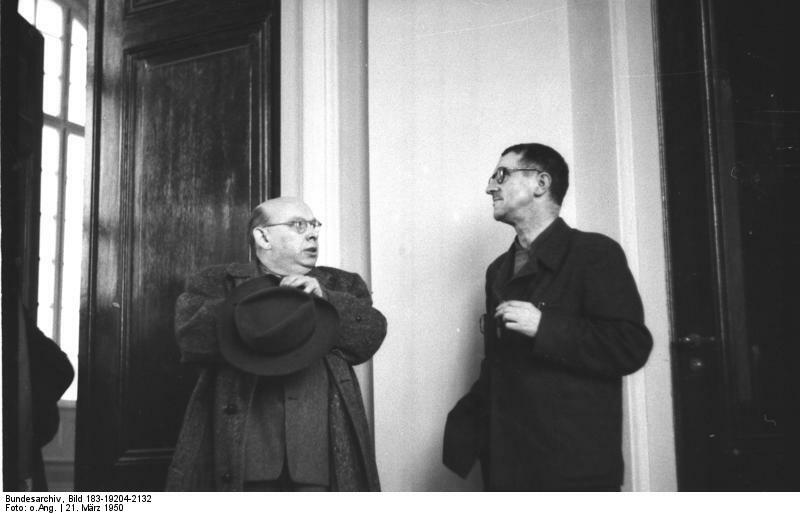 Also covered is the workers song "Einheitsfrontlied", originally written in 1934 by Hans Eisler with words by Bertolt Brecht although no words are used in this interpretation, only the marching rhythms of left, two, three… Eisler is shown here on the left with Brecht on the right. This was a Haden original written in response to the news of Chés death in 1967 and it precedes the Ornette Coleman track “War Orphans”. The closing of the album is “We shall overcome” a piece written in 1947 around a gospel song and under various forms and versions became associated with the Civil Rights movement. Joan Baez was one of the most high profile performers to recird a version around the same time as Haden in the 60s.